Village Ceramics’ studio can also be hired for private groups. Why not get a group of friends or work-colleagues together to spend a relaxing evening or daytime session creating ceramics. 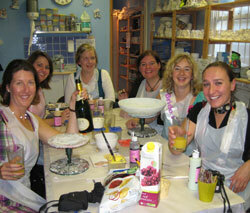 Hen parties and Baby showers are very popular. We handle the ceramics – you bring along the food and drink (or phone for a Pizza-pizza Express!). There is a minimum requirement of ten people for an exclusive evening session. Daytime group sessions we can accommodate smaller groups of 6. A non-refundable deposit is required for evening and daytime group sessions. An £80 (£8 session fee x 10 painters) is payable in advance for an evening group session, any extra people attending will be charged individually on the night. An £60 (£6 session fee X 6) is payable in advance for a daytime group session, any extra people attending will be charged individually on the day. Once you have arrived it’s just the cost of the piece being painted. Groups in the evening have sole use of the studio (not on Wednesday), but in the daytime this is not always the case. The studio is available on a Monday, Tuesday, Wednesday, Thursday and Friday evenings and sessions usually run from 7.00 / 7.30 p.m. to 10.30 / 11.00 p.m. Weekends are not available. Please note that a minimum of 10 guests is required for sole use of the studio in the evening time. Prices start from £10 per person.